All About The Benefits Of Mango Butter for Skin and Hair! 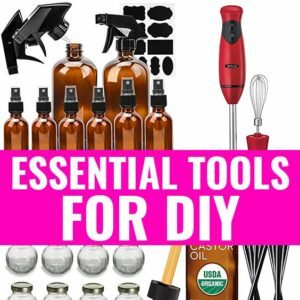 - beautymunsta - free natural beauty hacks and more! All About The Benefits Of Mango Butter for Skin and Hair! 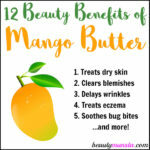 I must say, some of these magical benefits of mango butter will make you run and get your bottle of mango butter ASAP. You’ll find out why below! Mango butter has vitamin A, vitamin E, and antioxidants in abundance. The two advantages mentioned above enhance the scalp and skin, keeping them healthy and promoting hair growth on the head. Similar to shea butter and cocoa butter, mango butter’s benefits are consistent. The major difference, however, is that mango butter has more fatty acid, which makes it a better moisturizer. When moisture is lacking in the hair, it causes weakness and brittleness of the hair, later resulting in hair breakage and hair loss. Just a cup of mango butter is sufficient to provide the 25% of vitamin A and 80% of vitamin C you need on a daily basis. For hair growth, it was researched and found that vitamins C and A, are directly responsible for hair growth, making them indispensable features of mango butter. 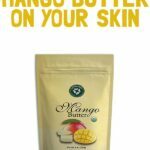 Mango butter can likewise protect the skin against ultra violet radiations and sun damages – thus making it is an amazing sunscreen for the skin. 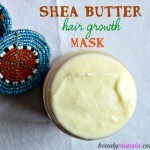 It can keep the hair moisturized and properly nourished. It provides the hair with the necessary vitamins required to keep it healthy. Through experiments, mango butter has been rated as one of the best solutions for the skin and scalp care. The butter is jam-packed with power, such that when it touches the skin and scalp, it keeps them hydrated and nurtures them. Mango butter is got from the fruit of the mango tree, which is a tropical timeless plant. Like it was mentioned earlier, due to its soothing properties, mango butter can help soften and moisturize the skin, protect it against sun damage, skin rashes, ultra violet radiations, eczema, poison ivy, insect bites, and so on. 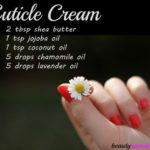 It can heal the skin from the damage caused by frostbite and sunburn. To even make it more effective, it is often mixed with some ingredients, especially because mango butter is harder in feel and may be difficult to apply alone. It can help in healing, softening and rejuvenating skin tissues. It can moisturize the skin and keep it subtle and healthy (subtleness of the skin aids the easy movement of the body). It can also be used to smooth fine lines on the skin and prevent wrinkles. It can be used after exfoliation of the skin, can be used to restore damaged skin, can be used to smooth acne, and can be used to make stretch marks fade away. At room temperature, the butter is quite hard, but after it has been applied on the skin, it matches the temperature of the skin, easily glides over it, and form a moisturizing layer. Mango butter is soothing for bug bites. The plenty fatty acids contained in the butter heals the skin of itchiness and cuts – it can speed up the healing process of a cut on the skin. Mango butter can serve as a good alternative for bathing soap – you can wash the skin with it. As a shaving cream, it is useful – it will help keep the region you are shaving moisturized. It can likewise function as a hair conditioner. Furthermore, it can be used as a massaging cream, which can help relax and calm the body. It is also said to be a wonderful cure for fatigue of the muscles. Dirt and other forms of pollution can cause oxidative stress on the skin. When this happens, a detoxifier is required. Mango butter is very rich in detoxifying agents, and that is why it is popularly used to detoxify the skin to get rid of the foreign bodies embedded within it. Mango butter has a sweet smell, and when it is at room temperature, it is in the solid form. When it comes in contact with the skin, it melts, thus proving protection for the skin by forming moisturized soothing layers on it. Although mango butter sometimes possesses this fatty acid smell, however, its aroma is not always very strong. This makes it useful in hair care formulations and in solid perfumes. Because it has the power to soften the skin and moisturize and nourish it, it is often used as an ingredient in balms. 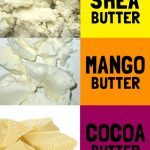 It can be used in place of shea butter to formulate whipped body butter because it will not harden as shea butter will, making it much easier to work with. To give your fresh creams, lip balms, and lotions more effective powers, you can add mango butter to them. When you are trying to prepare your next formulation, you can try to use mango butter instead of cocoa butter or shea butter, so that you can see and feel the difference in them.